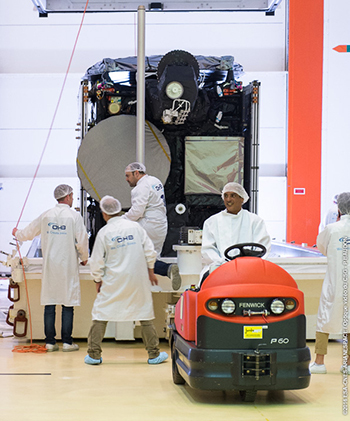 The “first of a new breed” in satellite design is undergoing pre-launch processing at the Spaceport in preparation for its liftoff from French Guiana in January on Arianespace’s next medium-lift Soyuz mission. 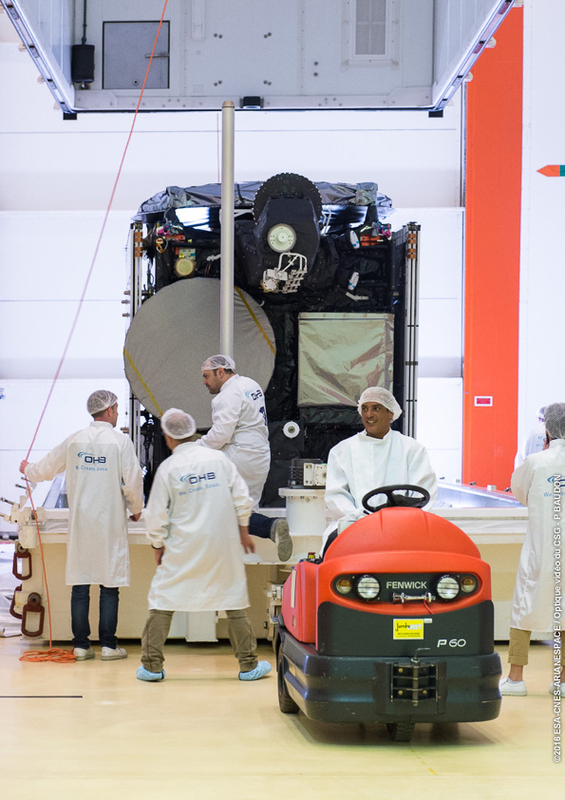 Shown during its initial processing at the Spaceport, Hispasat 36W-1 is the first satellite to be launched based on the SmallGEO spacecraft platform. Hispasat 36W-1 is the initial telecommunications satellite to use the SmallGEO series platform, developed under the European Space Agency’s (ESA) Advanced Research in Telecommunications Systems (ARTES) program. Its design and manufacture was performed by Germany’s OHB System AG. After launch by Soyuz on Arianespace’s Flight VS16, Hispasat 36W-1 is to operate from geostationary orbit for relay coverage and multimedia services across the Americas and Europe (including the Canary Islands) at the service of Hispasat, a world leader in Spanish and Portuguese broadcasting. Hispasat 36W-1 is configured with 20 Ku-band transponders and additional capacity for up to 3 Ka-band transponders. It incorporates an innovative antenna that actively reconfigures radio frequency beams, which – together with an on-board processor – provides greater flexibility to the satellite. The SmallGeo concept was created to enable ESA member nations to meet evolving needs in satellite telecommunications market, with spacecraft in this series sized for liftoff masses of 2,500-3,500 kg. – depending on the mission. As the premier SmallGeo spacecraft, Hispasat 36W-1 will weigh in three-plus metric tons, and is designed for a useful life of 15 years. 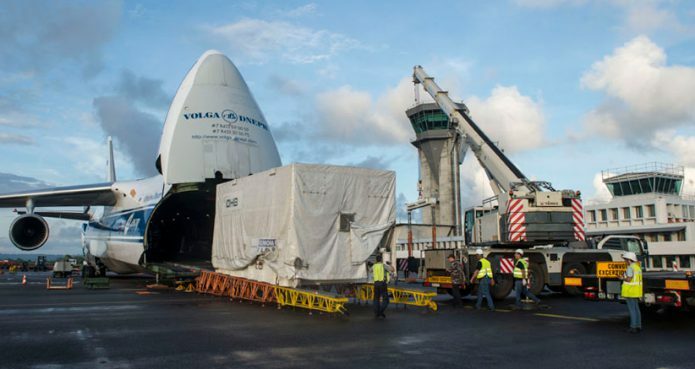 Arianespace’s Flight VS16 will be the workhorse Soyuz’ 16th launch from the Spaceport, operated along with its heavy-lift Ariane 5 and lightweight Vega from French Guiana.